While regulators and many scientists say biotech crops are no different from their conventional cousins, others worry that they are damaging the environment and human health. The battle is being waged at the polls, with ballot initiatives to require labeling of genetically modified foods; in courtrooms, where lawyers want to undo patents on biotech seeds; and on supermarket shelves containing products promoting conventionally grown ingredients. 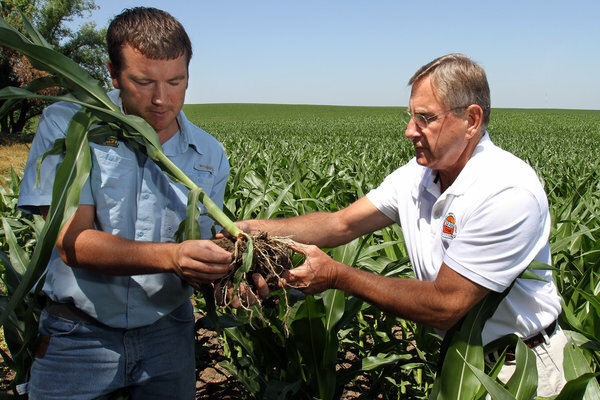 Dirt in two fields where biotech corn was being grown was hard and compact. Prying corn stalks from the soil with a shovel was difficult, and when the plants finally came up, their roots were trapped in a chunk of dirt. Once freed, the roots spread out flat like a fan and were studded with only a few nodules, which are critical to the exchange of nutrients. Read full New York Times article. Wonderful new website with beautiful, inventive photo-stories about traditional and emerging aspects of food sustainability. Dr. Sanjay Gupta reports on new research showing that beyond weight gain, sugar can take a serious toll on your health, worsening conditions ranging from heart disease to cancer. See the CBS 60 Minutes article, “Is sugar toxic?”. Mission: Slow Food Maui promotes locally grown foods and culturally diverse culinary practices for health, pleasure and island food security in alignment with the Slow Food movement. Vision: Food is a common language and a universal right. Slow Food USA envisions a world in which all people can eat food that is good for them, good for the people who grow it and good for the planet. Visit the Slow Food Maui webiste. The Sustainable Living Institute of Maui (SLIM) and EdVenture (formerly VITEC) at UH Maui College present their next Sustainable Business Pau Hana, “Green Business and Investing Locally”. The emerging green economy reflects profound shifts in how Americans are shopping, banking, and investing. As consumers consider the environmental, social, and governance issues of the companies making the products and services they purchase, the movement to “go green” has mainstreamed in recent years. Discover exciting opportunities to use money as a tool for social justice, community development, corporate reform, and ecological sustainability. Learn how to grow the green economy through education, standards, advocacy, and investment in a free provocative presentation with Michael Kramer and James Frazier of Hawaii’s own Natural Investments LLC at 5:30pm on January 26, 2012 at Maui College. Whether you want to create a Hawaii-recognized Sustainable Business Corporation, invest in our local green economy, make capitalism more compassionate and ecologically wise, or help alleviate poverty and build community capacity, many strategies are available today to align your values with your business operations, purchases, and investments. You’ll be amazed to hear what’s happening here in Hawaii to grow our green economy, and how these efforts connect to national and global regenerative and responsible practices and initiatives. Michael Kramer is an Accredited Investment Fiduciary, Managing Partner, and Director of Social Research at Natural Investments LLC. Michael has lived on Hawai`i Island since 1999, where he founded the Kuleana Green Business Program of the Kona-Kohala Chamber of Commerce in 2005 as well as the Kona Earth Festival. He currently serves on the board of the Sustainability Association of Hawai`i and the Hawai`i Alliance for a Local Economy, and is a 20-year permaculture teacher and teacher trainer. James Frazier is a local, green, and sustainable investing specialist with Natural Investments LLC, based in Maui and Port Townsend, WA. He is a co-founder of the Local Investing Opportunities Network (LION) of East Jefferson County, WA, and a finance graduate of the Wharton School of Business of the University of Pennsylvania. Outside the financial world, his passion for sustainable living has spurred him to explore permaculture, eco-building, natural medicine, yoga, renewable power systems, and more. RSVP to sliminfo@hawaii.edu. For more information, visit the SLIM website. The results are in from a 30-year side-by-side trial of conventional and organic farming methods at Pennsylvania’s Rodale Institute. Contrary to conventional wisdom, organic farming outperformed conventional farming in every measure. There are about 1,500 organic farmers in Saskatchewan, at last count. They eschew the synthetic fertilizers and toxic sprays that are the mainstay of conventional farms. Study after study indicates the conventional thinking on farming – that we have to tolerate toxic chemicals because organic farming can’t feed the world – is wrong. In fact, studies like the Rodale trials (www.rodaleinstitute.org/ fst30years) show that after a three-year transition period, organic yields equalled conventional yields. What is more, the study showed organic crops were more resilient. Organic corn yields were 31 per cent higher than conventional in years of drought. These drought yields are remarkable when compared to genetically modified (GM) “drought tolerant” varieties, which showed increases of only 6.7 per cent to 13.3 per cent over conventional (non-drought resistant) varieties.